Sales, training, maintenance and management. Our mission is to provide the aviation community with the highest level of professionalism and attention to detail. From buying or selling a plane, to improving your flying skills, we've got you covered. Call (608) 291-3360 today and get the personalized one-on-one service you deserve. Let us help you navigate the intricate process of buying or selling an aircraft. Our professionals have vast experience and technical expertise to protect your best interests and get the job done. Whether it’s earning your private pilot license, perfecting an instrument approach or just going out for a proficiency flight, we can help every step of the way. Learn more about our training options, including Cirrus flight instruction. Learn more. We are here to insulate you from the routine details associated with operating an aircraft, allowing you to focus on the flying. Fully customizable to your needs, we offer a comprehensive suite of aviation services. Learn more. Want to learn how to fly a Cirrus? 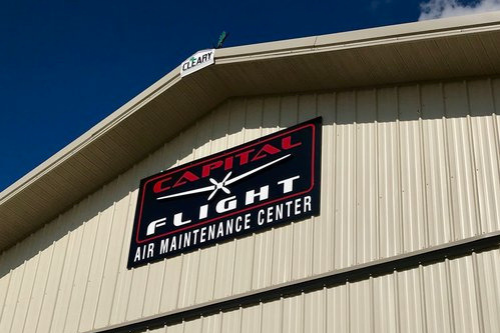 We now offer single engine piston maintenance in our newly acquired hangar, the Capital Fight "AIR MAINTENANCE CENTER (AMC)" Our on-field A&P, IA is available to service your single engine piston aircraft as well. Learn more. Capital Flight became a Cirrus Training Center (CTC) in July of 2017 and was awarded 2018 CTC of the Year by Cirrus Aircraft! Our flight instructors are carefully trained and evaluated by Cirrus headquarters, follow the same training programs that Cirrus uses during factory flight instruction, and holds pilots to the same high standards of excellence that Cirrus uses for flight training. Whether you are an experienced pilot looking to expand your flying experiences in a new Cirrus aircraft or someone who dreams of learning to fly in a new, technically advanced aircraft, we can tailor your flight instruction for a fantastic and exciting experience. Ready to up your tailwheel game? Capital Flight now has a beautiful 2017 Husky A-1C-200 available for tailwheel training AND rental! Whether you are a seasoned tailwheel pilot looking to work on your STOL (short takeoff and landing) skills or just entering the tailwheel arena, you are in for some serious fun. Big tires, grass strips…..who knew you could have so much fun so close to home?? (well we did…that’s why we knew we needed to add tailwheel training to our docket) America’s favorite taildragger, offering best in class performance, capability, versatility, reliability and safety. The Aviat Husky. Capital Flight is jazzed to be an authorized retailer of BestTugs. BestTugs are designed and built around a simple goal: to move all of your toys with one great looking, feature packed, incredible tug. Give us a call and we will show why one of these tugs will soon become your best friend.